Granted, fast food is pretty gross even on a good day. But this is horrible. It's easily the worst Wendy's I've ever been to. The food is always extra nasty. 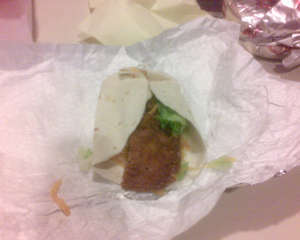 Look at this chicken wrap thing I got. Its like they keep their food in their socks to keep it warm or something. And the Fries.... oh man they are super nasty. I've had way better Wendy's from the one in Burlington, and thats after letting the food sit in the bag the whole way home from Burlington to Stoneham. Yeah seriously. Plus they are only open till Midnight. This would frustrate me if their food was good. Oh well.